Federated Department Stores Inc., operator of Macy's and Bloomingdale's, has reached a deal to buy rival May Department Stores Inc., a source familiar with the deal told The Associated Press on Sunday. Exact terms of the deal could not be determined. The executive, who spoke on condition of anonymity, said Federated will pay less than $36 for each May share under the deal, which will be formally announced Monday. The deal would be worth a total of about $10.4 billion, with Federated paying about $35.50 in cash and stock for each May share, according to The Washington Post. That would be a 15-cent premium to May's closing price of $35.35 Friday on the New York Stock Exchange, after its shares rose $1.50, or 4.4 percent, that day. The boards of the two companies approved the deal over the weekend, according to The Post, which cited executives close to the merger in a story published on its Web site Sunday night. The deal would bring together Cincinnati-based Federated with the company known for its Marshall Field's and Lord & Taylor chains, creating a company with 1,000 stores and $30 billion in annual sales. "It's all winners. This deal is good for shoppers. It will result in better fashions and sharper price points," said retail industry expert Burt Flickinger, managing director at Strategic Resources in New York. Messages left seeking comment Sunday night from a Federated spokeswoman and several members of the company's board were not immediately returned. The merger, which still needs to be approved by shareholders and regulators, comes as retailers look to consolidate in order to reduce advertising and other costs while gaining bargaining power with suppliers. Just last November, Kmart Holding Corp. agreed to buy Sears, Roebuck & Co. for $11.5 billion. Federated and St. Louis-based May have discussed a possible merger on and off for a couple of years, but speculation heated up when May Chief Executive and Chairman Gene Kahn abruptly left in January. That cleared the way for Federated Chairman and CEO Terry Lundgren to head the combined entity. May stock has been rising in recent weeks in anticipation of a deal, including the 4 percent jump Friday. The stock has ranged in price from $23.04 to $36.48. Federated shares closed at $56.79 on Friday, near the upper end of its 52-week range of $42.80 to $59.91. May's performance has lagged behind competitors such as Federated and J.C. Penney Co. as it has failed to come up with a compelling merchandising vision under Kahn and has consequently resorted to aggressive price cutting to bring in customers. May is given credit for its warehouse and distribution operations, while Federated has done a good job in upscaling Bloomingdale's. Some analysts have suggested that uniting two of the nation's largest department store chains would create a more efficient operation better equipped to go up against discounters. Together, the companies also could wring savings out of their merged retail systems and buying clout, some analysts suggested. Others questioned whether the two retailers would be a good fit, citing the belief that Federated may be more upscale and May always margin-oriented while lacking on the merchandising side. Together, Federated ($15.6 billion) and May ($14.4 billion) had $30 billion in sales in 2004 - more than J.C. Penney ($18.4 billion), but less than Target ($46.8 billion) and Sears, Roebuck and Co. ($35.7 billion). All were dwarfed by Wal-Mart ($284.8 billion). 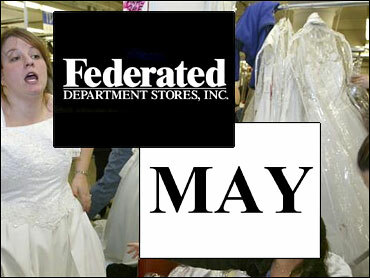 Federated operates more than 450 stores in 34 states, Guam and Puerto Rico under the names Macy's, Bloomingdale's, Bon-Macy's, Burdines-Macy's, Goldsmith's-Macy's, Lazarus-Macy's and Rich's-Macy's, although all are being converted to the Macy's or Bloomingdale's name. The company also operates macys.com and Bloomingdale's By Mail. May operates 500 department stores under the names Famous-Barr, Filene's, Foley's, Hecht's, Kaufmann's, Lord & Taylor, L.S. Ayres, Marshall Field's, Meier & Frank, Robinsons-May, Strawbridge's and The Jones Store. The company also has 229 David's Bridal stores, 458 After Hours Formalwear stores, and 11 Priscilla of Boston stores.